The small intestine, after the stomach, is the second most common primary site for gastrointestinal stromal tumors (GISTs). This study aimed to identify clinicopathologic prognostic factors of tumor recurrence and survival and to analyze the influence of imatinib and sunitinib for small-intestine GISTs. 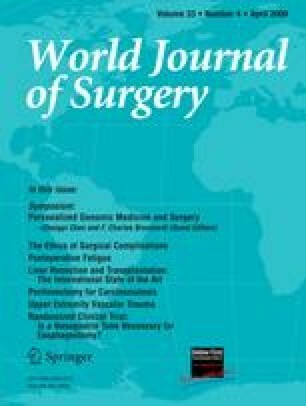 We reviewed the surgical experience of patients with small-intestine GISTs at National Taiwan University Hospital from January 1995 to March 2007. We analyzed the perioperative clinicopathologic data and treatment course. Seventy patients were included. The tumor was local in 43 patients, advanced in 21 patients, and 6 had metastasis. The median size of the tumor was 6.5 cm. Forty-four patients had a mitotic rate of less than 5/50 high-power field. The 1-year and 5-year disease-free survival rates were 85 and 66.7%, respectively, while the 1-year and 5-year overall survival rates were 98.5 and 86.6%, respectively. There were 19 patients with recurrent disease and 6 patients died of intestinal GISTs. The response rate of imatinib and sunitinib were 73.3 and 60%, respectively. According to multivariate analysis for disease recurrence, only invasion status, tumor size, and mitotic rate are significant (P = 0.007, 0.035, 0.007 respectively). They are also associated with poor survival (P ≤ 0.001, 0.006, 0.002, respectively). The invasion status, size, and mitotic rate of tumor involve higher risk of recurrence and poor survival in small-intestine GISTs. The patients with recurrent small-intestine GISTs may have a lower mortality rate after using imatinib and sunitinib.